Milestones. We all have them. That picture of the first steps or the first time we ride a bicycle. The certificates we receive when we graduate from kindergarten...high school, college are all milestones documented with pictures, celebrations, and plaques we hang on our walls. Our great nephew Jordan had a milestone today. 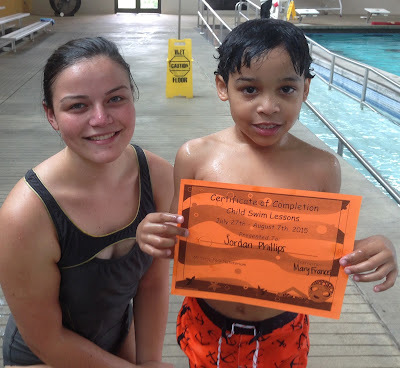 He finished his swim team lessons. He's been going daily for two weeks and working hard every day. His teacher Mary Francis looks angelic to me and she has been great with Jordan. I texted the shot to his mom, and his nana and pawpaw. He was proud of it. I know because he held it on the way home. We didn't talk a lot, but I could hear him in the back seat reading the words. While he did his final lesson, I swam. I was much stronger today and there was a lot less flailing. I almost dozed while having lunch. When I said, I am whupped. Jordan said swimming will do that to you. Apparently he did learn some things in his swim lessons. Those who earn a child's trust are angels, indeed. Neat photo! Lovely photograph. I'm sure this time in his life will be fondly remembered for years to come. Well done Jordan! He's dead right, swimming does make your tired. Jordan is so wise to recognize how swimming makes you tired. Congratulations Jordan. You should be so proud of yourself. Milestones like that will always be remembered glad you got a picture of it and shared it too. Congrats Jordan! Just one milestone in many that he has and will receive in the future! Are you going to continue swimming? Sounds like you deserve a certificate too!